When I was a homeowner, I fashioned an office out of one corner of the rec room. On one wall, I placed three floor-to-ceiling bookcases and crammed them with books. Naturally I hadn’t read all of them. But I made it through about a good quarter of them. And I’m sticking to that story. But the chief reason to keep all of my books at hand was primarily because seeing all of that knowledge and creativity in one place felt comfortable to me. They were my intellectual fleece blanket. Now that I’ve moved (donating my collection to the local library), I have my assembly of electronic bookcases: the iPhone, iPad and MacBook Air (no assembly required), replete with iBooks, the Kindle and B & N apps, et al. And I still always keep them within my reach. I like to have them near. But because books are now digital, impulse buying has become an addiction. So, my collection has begun growing all over again. “How many of these have you actually read?” my father asked one day. “Uh …” was my response. So now, I make it a point to read one book for an hour every night, in addition to all the articles I read in e-zines and on websites daily. So, how do I remember what I have or haven’t read, or even what’s in my collection? Now, hopefully my eyes can boldly go where my eyes have rarely gone before. What you will first find most impressive about Calibre is it’s seemingly endless number of sets/subsets that exist or can be created. And the customization is boundless. As the application is utterly thorough, the learning curve can be a bit steep. But once everything is entered, you’re home free. At first, the UI may seem a bit daunting. But once you work with it a bit, its ability to allow you to tailor your searches and find your desired reading material posthaste is invaluable. It also supports searchable criteria such as tags, comments or any advanced search queries you can construct. 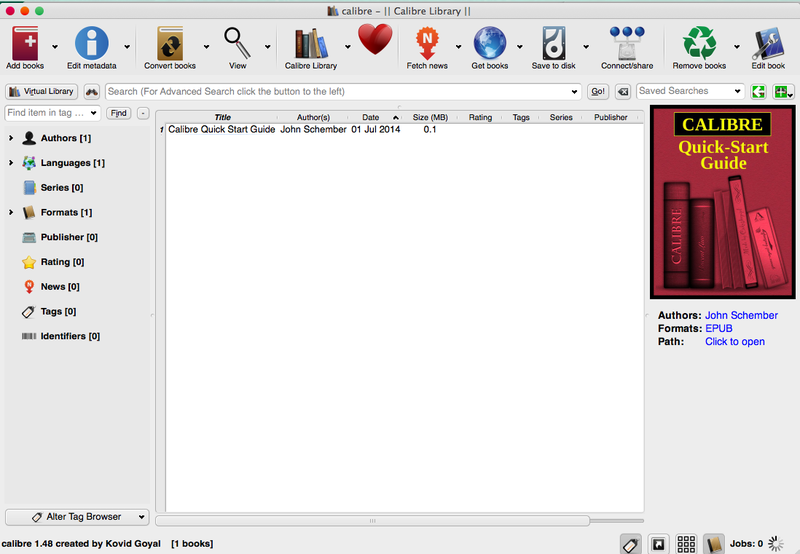 Plus, calibre will even go out onto the internet to find basic book metadata such as the book’s ISBN information and a summary of the book. A unique feature is that Calibre will also find all the variations of the book’s covers for you. You can then choose which one you would like to assign to its entry. Conversion from one format to another is simple. 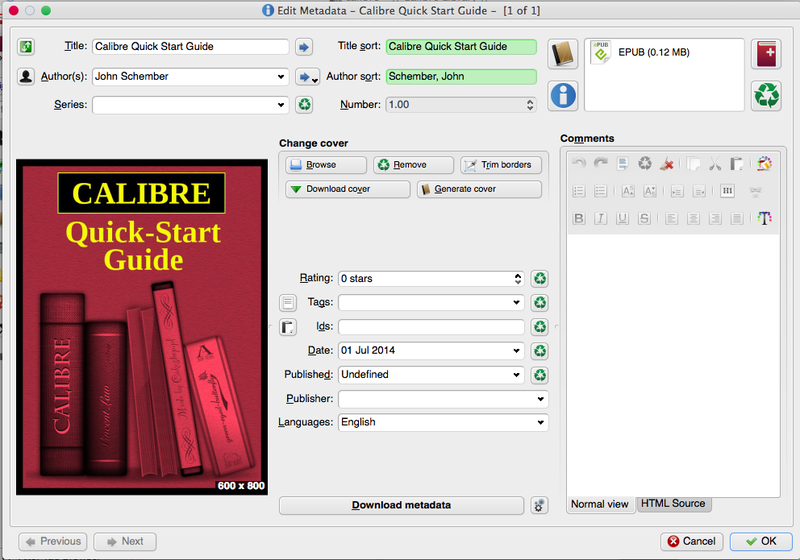 And Calibre supports all the major e-book formats. You can rescale your font sizes so that the output is readable easiest for you, no matter the original font size of the input document. It will automatically detect or create your book’s structure, such as chapters and Table of Contents. There’s a “modular device driver design” that adds support for a large number of current devices (iPad, Kindle, what-have-you). Calibre will automatically choose the best format for your device. If none of the formats is suitable, Calibre will automatically convert the e-book to a format suitable for the device before sending it. Calibre can also serve as your RSS reader. It has over three hundred news sources, The news system is plugin based so users can easily create and contribute new sources to the Calibre community. Or choose from The New York Times, The Wall Street Journal, The Guardian, or ESPN to name but a few of the over three hundred news sources! There is so much that can be done with this app, that you should visit Calibre’s site and watch the demo to learn of its multitude of available features. Think of it this way: Calibre is to your ebook library what iTunes is to your music library or whichever third party software you use to keep track of all of your video files. Definitely give it the once over. This entry was posted on Sunday, October 5th, 2014 at 11:56 pm	and tagged with Apple, Apple software, Frank Petrie, iOS software, Mac software, reviews, software, YMP, YMPNow and posted in Reviews. You can follow any responses to this entry through the RSS 2.0 feed. « Wait A Tick! I’m My Father’s Mac!